Raith Rovers striker Kevin Nisbet has thrown his weight behind caretaker manager Kevin Cuthbert getting the job on a permanent basis. Cuthbert made a raft of changes for the trip to Brechin on Saturday, switching to a formation that resulted in Nisbet featuring at right wing back. The move drew criticism from some fans, who wanted the club’s top scorer further up the park, but Nisbet himself revealed he is familiar with the position, and is enjoying working under the interim boss. “I’ll play wherever Cat wants me to play,” he told the Press. “I’ve got experience in that position, and played there a few times last season. “If I keep scoring, then I’m happy to play anywhere. “I’m a striker so I just need to be clued on for the 90 minutes and make sure I don’t switch off. We all love Cat and we’re 110 per cent behind him. Cuthbert will remain in charge for a third match – at home to Montrose this Saturday – as he seeks his first win as interim boss. Asked whether he would like to see him remain at the helm, Nisbet replied: “Of course. Nisbet revealed that disruption for the players has been kept to a minimum following Barry Smith’s shock resignation a fortnight ago. Nisbet scored his 10th goal of the season on Saturday, netting from the penalty spot after the referee blew for a foul on Chris Duggan. “I don’t know if it was a penalty, but I’ll take every opportunity I can get and thankfully I put it in,” he said. 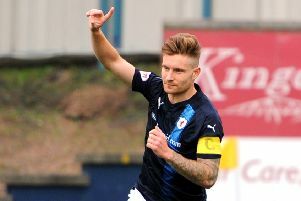 Despite struggling to make an impact at his previous clubs, Nisbet has been a scoring sensation since earning a deal with Raith in the summer. “I believed in myself that I could come here and score goals, I just had to get the chance,” he said.